“We become a better state and people in it once we build better society, within what young people won’t longer seek for a full life outside Ukraine but will be able to live a full life in their Motherland. 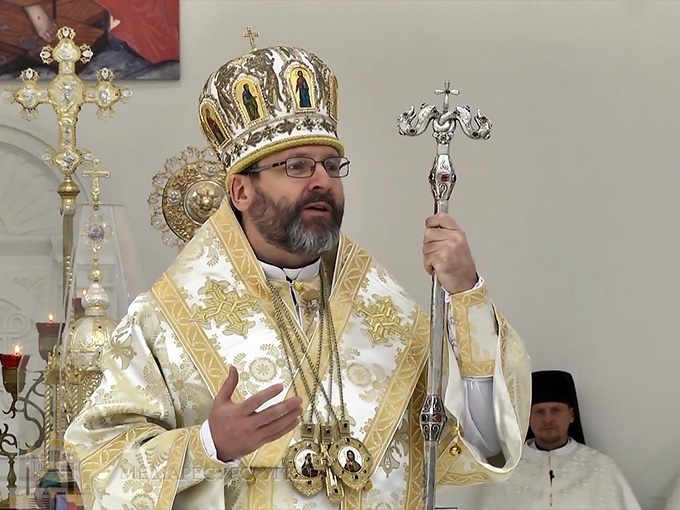 A position expressed by His Beatitude Sviatoslav, Head and Father of UGCC during his homily to the faithful in the Patriarchal Cathedral of Resurrection of Christ. In today’s Gospel we heard a story of Jesus meeting a young rich man, who asks Him “what shall I do to inherit eternal life”, and God replies “go, sell what you have and come, follow Me”. This respond of Jesus shows an absolutely different perspective: to live a full life one has to be as good as God is. “And it means giving, exactly what our God does. We believe in God Who takes nothing but is the source of any goodness. He gives us everything what we need”. According to the preacher, contemporary world often lives by idolatry of success – to become successful by any means, even in the way of humiliation or destruction of a neighbor. “Whereas to become a successful politician you even ought to step over dignity of people and turn them into the electorate what is manipulated in order to get more votes and a better place in the parliament. But the one who acts like this – died already. Things he took from his neighbor will never make him a human totally. The preacher reminded one of the most important messages left by His Beatitude Lubomyr – be a human. “The importance to be but not have is a cell of Christian spirituality. It is not what we have means but who we are”. Head of UGCC assumes that these words is sort of a motto for the Ukrainian society. We have already felt an electoral campaign to be started. “A vast amount of candidates propose themselves today. Yet, listening to them ask us and them not what they have but who they are”. “Be a man who really understands that God is the Only Who has to take the first place, and later, according to the proverb, everything else gets its own places”, His Beatitude Sviatoslav wished everybody.